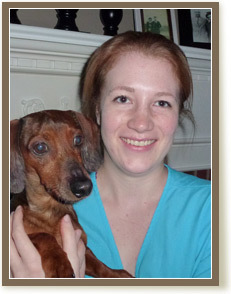 Spending time with our clients' pets is receptionist Bethany Grant's favorite aspect of her job. Her other responsibilities include answering phones, filing, and helping pet owners with preventive care and client education. Assisting Doctors with surgery and anesthesia is yet another area where she excels. She is very skilled at multi-tasking which is very helpful when greeting clients, answering phones, and ordering medications and supplies all at once! Bethany graduated from Saint Michael's College with a bachelor's degree in biology and has been working in the animal-related field for 10 years. She shares her home with her cat, Hazel, and her Siberian husky, Inuit. In her spare time, she enjoys participating in showing Inuit for conformation at local shows. As our receptionist, Debra is often the first to meet and greet pets and pet owners as they enter Attleboro Veterinary Clinic. She grew up in small-town Vermont and brings that down-to-earth style to our clinic. Her friendly and welcoming personality helps our clients feel comfortable and puts their pets at ease. Debra's responsibilities include checking clients in and out of the clinic, answering phone calls, processing invoices, completing chart information, and helping with pet appointments. Debra holds two bachelor's degrees, one in animal science and the other in English, and she joined our staff in August 2004. The family atmosphere at Attleboro Veterinary Clinic creates an environment where her "co-workers feel more like siblings," Debra says. Her favorite part of her job is when she gets time to play with the pets in the waiting room. "I love when I have time to talk to the clients and pet our patients while they wait for their appointments," she said. "Our clients feel like family to me. 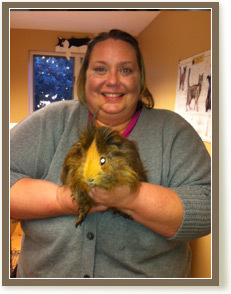 Attleboro Veterinary Clinic allows every staff member a chance to interact with the animals – even the receptionists!" Debra has four of her own pets at home: two cats named Louie and Rocky and two dogs named Duncan and Connor. When not at the clinic, she enjoys spending time with these furry friends and her human family, too. She likes to read, walk, swim, and watch TV and movies. She and her husband frequently travel to Vermont to visit relatives and, predictably, her pets love to go along for the ride. 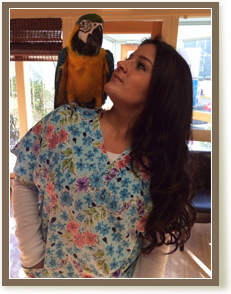 Nicole's strong work ethic and great sense of humor make her an important part of Attleboro Veterinary Clinic's reception staff. She is always calm and steady no matter how hectic the situation which is one of her many great attributes! One of her favorite aspects of her job is "hanging out with the kitties and doggies" and giving them cookies. 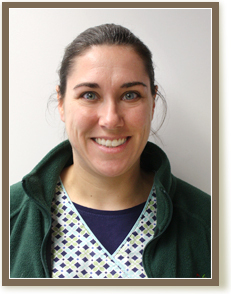 Nicole has worked with animals for eight years and worked at a daycare facility for dogs prior to joining our Attleboro Veterinary Clinic staff in May 2007. "All of the staff at Attleboro Veterinary Clinic works well together," she said. 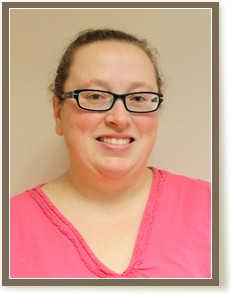 "We have a great staff overall, we all enjoy meeting and greeting clients, and we learn many new things every day." Nicole is mother to two young children and one shih-tzu/maltese named Ella. In her free time, she enjoys reading, walking Ella, spending time with friends, and relaxing alone with a little quiet time. Growing up in Texas, April always either had a dog or a cat, and also a Quarter Horse. In College, she had an opportunity to work with people who suffered from advanced Alzheimer's and traumatic brain injury. While there, April had the opportunity to witness the use of animal therapy with her patients, and became intrigued with the way that animals could help calm these patients, ease their frustration, and encourage them to persevere. After College, she worked for many years as a Veterinary Technician, with a special interest in Emergency Medicine, and in recent years she has transitioned to Receptionist. In her present position, our clients can benefit from her knowledge and insight gained through her many years in the field. Her calming, friendly, down-home Texas manner and sense of humor makes pets and people feel at ease! Her family includes her husband, daughter, two cats and two guinea pigs. Katie has been working with animals for over 16 years. She first worked with Dr. Siegel two jobs ago as a 19 year old and Dr. Siegel was thrilled to be reunited with her after he bought his own practice! Katie is truly a force of nature! She can do it all, with high energy, a quick mind and a big smile, being equally adept at the reception desk, the exam room, and the surgical room. 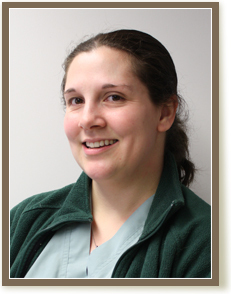 As a veterinary technician at Attleboro Veterinary Clinic, her responsibilities include assisting the veterinarians during examinations, taking x-rays, and monitoring the pets during surgery. Katie shares her home with two dogs (Dottie and Bear) and three cats (Scamper, Bert, and Max). Lisa Peterson, one of our veterinary technicians, brings a great deal of compassion and laughter to Attleboro Veterinary Clinic. Although taking pet x-rays is her favorite duty, she also enjoys her additional responsibilities including helping our veterinarians during examinations, surgeries, and other procedures. Lisa graduated from college with her bachelor's degree in animal science, has been working with animals as a veterinary assistant and technician for 13 years, and joined our staff in July 2012. "I like working at Attleboro Veterinary Clinic because it's a small, fast-paced clinic," she said. "I enjoy my co-workers and sharing animal stories and am getting to know the clients and pets better as my time here increases." In her free time, Lisa enjoys going for long walks and drives with her two dogs, Aspen and Mazie. She loves to be outdoors in the sun doing anything, including yard work. Her new and latest passion is camping. 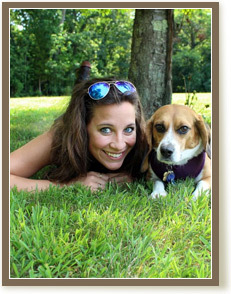 Isabelle brings to AVC a passion for helping animals and their people. In addition to being certified as a Medical Assistant and an EMT, she has a long history of caring for animals in need. 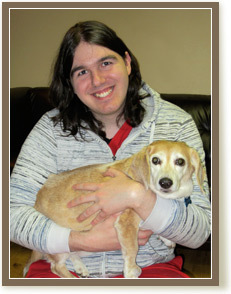 She has a "can-do attitude" and her comforting, fun loving presence helps make a visit to AVC feel like home! She lives with her dog Bentley (a four year old Cockapoo who has a disability), and pet-sits in her free time. Izzy contributes to our clinic in so many ways, which includes a special combination of sweetness, humor, compassion and also the ability to do some quick carpentry work or jump start a car! Pam brings well over a decade of experience in private practice and critical care / emergency practice to AVC. She grew up in an "animal family": "My Mother was the "cat lady" of the neighborhood! She took in any animal in need. At one point we had seven cats and three dogs!" Dr. Siegel adds, "Pam always has a smile on her face and you can see the happiness that just holding an animal brings her." Pam says that she enjoys helping pets in any way possible to make them feel better and relieve any discomfort that they may experience. She also finds that some of the most scared pets, often some of the smaller dogs, respond so very well to her touch! Jenny, from an early age, has had an extremely wide variety of animals as pets. Some examples, besides dogs and cats, are turtles, a gecko, hamsters, gerbils, and rabbits to name a few! Jenny has also had an interest in horseback riding and in her spare time is a dog groomer. She tells us, "I always wanted to work with animals. They simply give me a feeling of joy inside." She adds, "One of the things I enjoy most about my job is to make a connection with other people involving our shared love for animals." Brittany graduated with a B.A. in Biology from Franklin Pierce University in 2012 with the intention to obtain her Doctorate in Physical Therapy. After working for a year in human medicine at an urgent care facility, she realized that her passion lied elsewhere. Brittany has always connected with animals; so much so that her mom jokes that she is a "dog whisperer", being able to train her family pets with ease. Brittany is now pursuing her Veterinary Technician Degree from Mount Ida College and is motivated by helping your pets here at AVC! 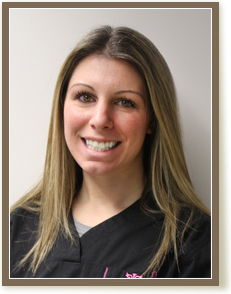 We enjoy having her gentle, loving manner and great smile at our clinic! Lindsay started her career path at Bridgewater State University where she received her Bachelors in Biomedical Science. Upon graduating, she began volunteering at a local animal shelter where her duties included administering medications, socializing, training, and introducing cats and dogs to families interested in adoption. 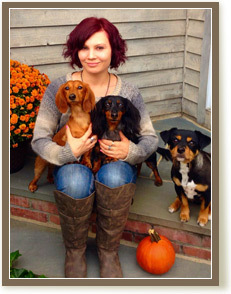 Lindsay had a meaningful experience caring for two neglected dogs: Bristol, a Pit Bull, and a Plot Hound named River. "They were starved, abused, and very sick, but amazingly, they were the sweetest, most loving animals." Thankfully, they are now rehabilitated, and now in safe, loving homes. 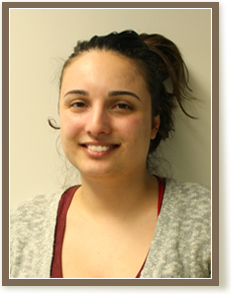 Lindsay is now working with Dr. Siegel to pursue her Veterinary Technician License. Through her compassion and enthusiasm for her work, Lindsay shows pets and the people who love them how special and cared for they are. Though Steven was always an avid animal lover, he actually expected to become a carpenter or construction worker! His dad taught him everything from laying tile to installing plumbing fixtures, basically everything related to home improvement. Then, several years ago, a friend told him about a job opportunity working with laboratory animals at Boston University and he was hooked. Since then, Steven has worked with a variety of species ranging from mice to primates, guinea pigs to ferrets. 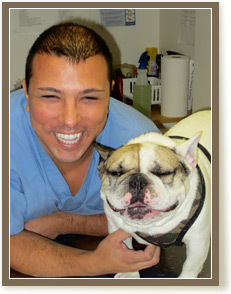 For five years prior to joining our practice, Steve worked as a veterinary technician in oncology at Angell Memorial Animal Hospital in Boston, helping care for pets with cancer. Steven has been with us since January 2012. We value his technical skills such as an expertise in placing IVs, and his upbeat attitude and friendly teasing keeps the team loose. His kindness to all the pets and their owners always shows through. An added bonus is that he has become the "Mr. Fix It" around our clinic and is eager to take on many side projects and repairs, so maybe he is achieving both of his career dreams after all! He lives (and does plenty of carpentry!) with his wife and French Bulldog, "Leroy", in their new home. 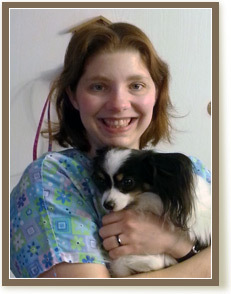 TaraLynn has been a veterinary technician for 7 years. She knew from a very young age that she wanted to work with animals, which is why she attended an Agricultural High School. There she majored in Veterinary Medicine. She has worked in both general and emergency veterinary hospitals, and brings a wide variety of skills from both of these different settings to our practice. Currently she has three cats, two ferrets, and two rats at home and is looking forward to getting a dog in the near future. She says, "Working in animal medicine is a very rewarding field and I couldn't imagine doing anything else with my life." Jordan, our big-hearted, calm and kind, six foot three "Gentle Giant", has been with our practice for several years. He has two wonderful dogs, "Boscoe" and "Flash", and in the past has had an intense interest and affection for more unusual pets, namely pet rats! Jordan brings experience in both the human and animal side of medicine as he completed a course to be a human medical assistant as well. In his spare time, Jordan partakes in martial arts and complex computer games, and has been known to dabble in the drums as well.